The fight to legalize The Egg is in The Wall Street Journal! Here’s the link to the fantastic article written by David Marcelis. You need to be a subscriber to read it. They have a $1 for two months digital subscription available for the next day or so. 🙂 #FreeTheEgg Yay for spreading the word! I recently had a chat with David Marcelis of the Wall Street Journal. He shared an article he wrote in 2015 about King Cakes, which are on our Violators page. King Cakes violate the 1938 law that keeps the Kinder Egg banned, but the ban isn’t really enforced with King Cakes. Why, you ask? Read Mr. Marcelis’ article. It’s great to have him in our corner! I’m an avid genealogist. 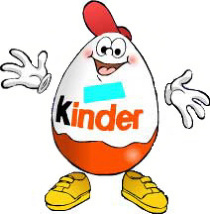 This morning, I’m sitting here looking at Newspapers.com (a really cool website of newspapers from long, long ago to pretty recent) and thought, “Huh, I’ve never put in ‘Kinder Eggs’ before. Let’s try that.” WHAMO – articles galore! Unfortunately, because Newspapers.com is subscription based, I cannot legally screen capture and share articles. And since I actually do have a life outside of fighting for The Egg (really, I do! ), I only made the effort to find one from an outside source. Here it is. http://www.greatfallstribune.com/story/money/2016/12/15/time-nearly-smuggled-contraband-chocolate-across-border/95475876/ – Fun read, but the picture is not accurate. The box of “Kinder Eggs” are actually Choco Treasure. They must have taken the picture before they opened the box.